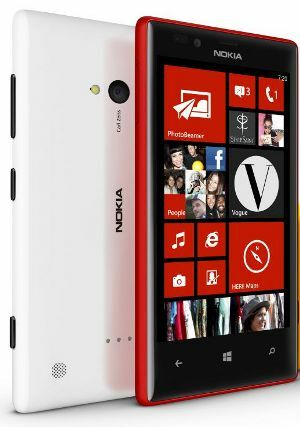 Nokia officially launched their new Lumia 720 Windows phone in india, now available on Nokia India Store and other online stores. Previously it was announced in last month alongside with Lumia 520 phone and Lumia 720 is a high range mobile and having more features than Lumia 520. Lumia 720 runs on Windows 8 operating system and comes with 4.3 inch IPS LCD capacitive touch screen with 480x800 pixels resolution. It is powered by 1 GHz dual core Snapdragon processor and 512 MB of RAM. It has 8 GB of internal memory and external memory up to 64 GB with micro SD cards. Lumia 720 has a 6.7 MP auto focus camera with LED flash support and can take HD videos in 720 pixels and there is a 1.3 MP front camera for video calling feature. It contains 2000 mAh battery that gives 23 hours of talk time and 520 hours of standby time. The connectivity features are 3G, blutooth, Wi-Fi and GPS. Lumia 720 now available for the price of Rs. 18999 on Nokia India store and other online stores like Flipkart. It comes in five colors such as Yellow, Red, Cyan, White and Black colors.